One of the unfortunate things my two oldest kids have inherited from both their father and I is poor vision. Amblyopia, or lazy eye, to be exact. 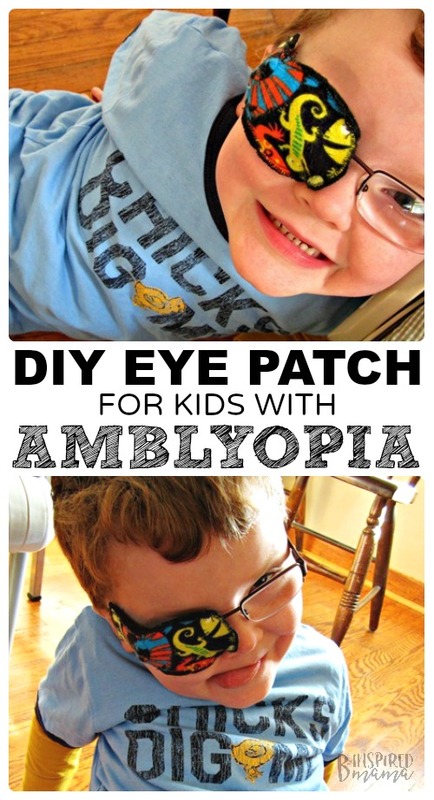 Maybe you have a little one struggling with Amblyopia, too? “Lazy eye is also known as Amblyopia. Lazy eye is an early childhood condition where a child’s eyesight in one eye does not develop as it should. The problem is usually in just one eye, but can sometimes affect both of them. 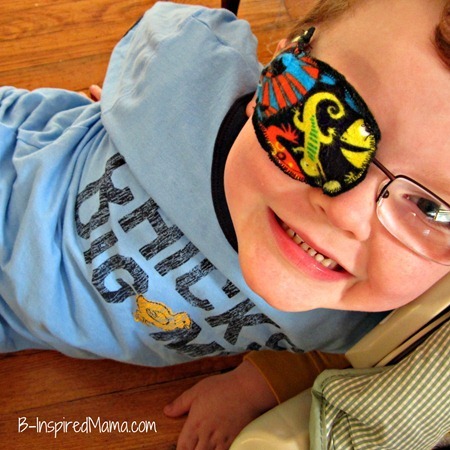 My Sawyer has been wearing glasses since he was 18 months old, but his amblyopia has just now progressed to the point where he needs to wear an eye patch, too. His pediatric ophthalmologist has prescribed wearing a patch over his stronger eye for 2 hours per day to give his weaker eye practice and exercise. I know longer hours are often prescribed for eye patches for kids, so I consider our mere 2 hours per day lucky. In fact, I remember being prescribed to wear one the entire day when I was in Kindergarten. My mom would put it on me before putting me on the school bus in the morning. And I would take it off as soon as she was out of sight! (Could be why my amblyopia is still a problem now.) I know my mom wasn’t the only mama to fight with her child over wearing an eye patch. Not only do they look “different” from peers, but they can be uncomfortable and tiring for the eyes, too. 1. 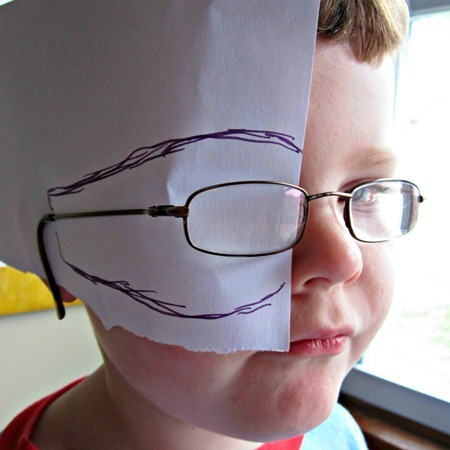 Place a piece of paper under your child’s glasses and trace a rough shape around the glasses for your eye patch. 2. Cut the shape out of the paper to use as your template. 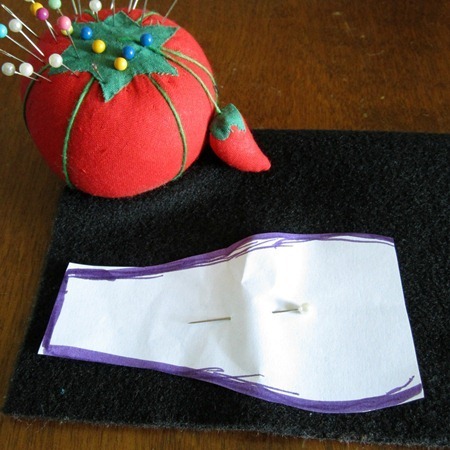 Use it as a template (by pinning it down and cutting around it) to cut out two pieces from the felt and one piece from the fabric. 3. Trim the fabric piece just a tiny bit around all edges so that it is slightly smaller than the felt pieces. 4. 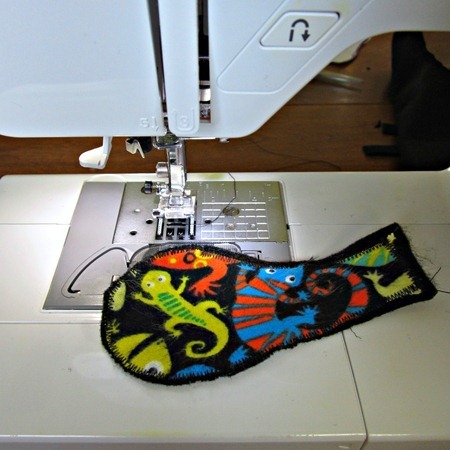 Place the fabric piece wrong side down onto one felt piece. 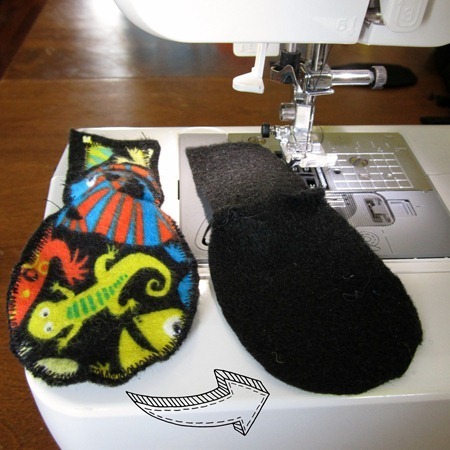 Using a tight zigzag stitch (or a blanket stitch if sewing by hand), stitch along all edges. 5. Fold the sewn piece as shown above and use a straight stitch to sew across each corner (where the white lines are in the photo). Repeat this on the other felt piece. This will create the slight bend in the patch. 7. 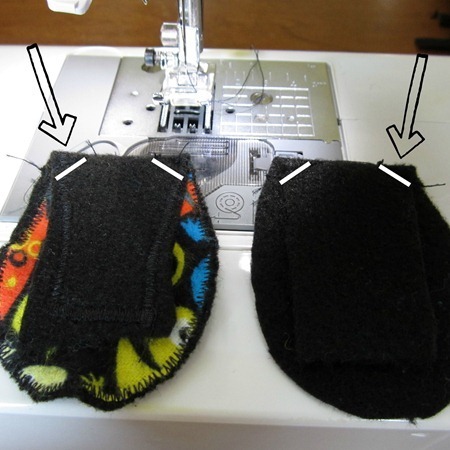 Use a straight stitch to sew the top and the bottom of the pieces together leaving an opening around the side of the curve and the small straight edge for the glasses to slide through. Slide the patch onto the arm of the glasses, and you’re all set! Does this look like a kid that has any confidence issue because of his eye patch? NOPE! 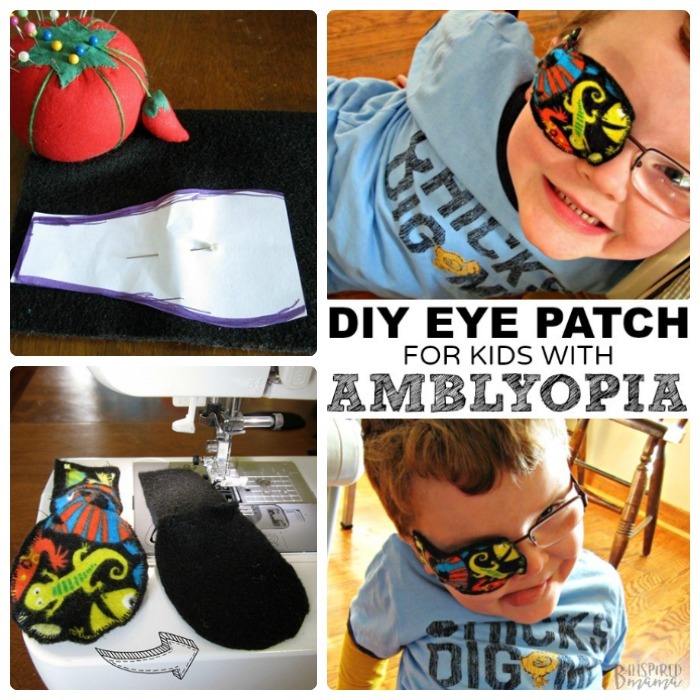 Psst… Make a BUNCH of eye patches for kids – they’ll get lost easy. Trust me! No Time for DIY Eye Patches? This post was first published on April 23, 2012. God bless you! Thanks a lot for such a great idea. I’m already doing one for my little one. Kisses from Spain! Oh, yay! So glad it helps. Thanks for the positive feedback. Thank you for this pattern! I found it on a Pinterest and immediately made one for my son! He only needs the patch a little every day at this point, but I can already tell this patch is going to be such an improvement! And I LOVE that I can use fabric scraps from other projects to personalize it for him! THANK YOU! Oh, this makes me SO happy to hear it will help you and your son get through patching (even if almost done – hopefully!) a bit better. Thank you for sharing with me! Oh it makes my day when I hear that this was helpful for another mama! You’re so welcome! Glad to be of help. I know its been a while since you posted this but I must ask, did you have any issues with his glasses slipping down and him being able to find some “peek a boo” spots?? I asked my daughter’s eye doc about making her one but that was his concern is that her glasses would slip down and she would be able to see around it. just thought I would ask before I get the stuff to make. thanks! My son was (and still is) notorious for having his glasses at the end of his nose. But the patch is big enough around the glasses that it didn’t seem to be a problem for him at the time. I can’t promise, though, I guess. Thank you so much for sharing this!! My 6 year old has a lazy eye…had surgery a couple years ago and now we have to patch again for 2 hours a day! Its such a challenge…even getting him to keep his glasses on is a challenge…Im going to make this and hope it helps…he loves the pictures! I will keep you posted!! Oh – this just made my day! I hope it helps him. Let me know if you have a questions! then it is certain you need to apprehend your diet by making changes that would work for you. Is there a diet out there that will really work. Thank you for sharing your tutorial. With just some scraps around the house, I was able to make something my daughter loves…well, as much as you can love something you’d rather not wear. Oh, I’m so glad it helped, Robin! I love this idea. It seems simple enough… but I am not crafty at all. I will do my best! Thanks for the tutorial! I just used your tutorial to make a patch for my son. Thank you!! Oh, I’m so glad that it’s helping others!! I have a 4 month that doesn’t wear glasses yet but need to patch 2 hours a day, he gets a rash from sticky patch. Is there a way of adapting this for no glasses? Maybe stitch some soft elastic to the ends like a headband? I did that for the fake patch I made my three year old. She wanted to match her brother, but her eyesight is fine! Since she doesn’t have glasses, we used elastic to hold it on. Yes, I would agree with Gyen, to add some soft elastic to it that could go around his head. Good luck, Mama! I just want to thank you so very very much for this post!!! My 6 year old was diagnosed with Amblyopia over a year ago. Your page was sent to me by a friend a few months later (sometime last summer) when the doctor said we had to patch. I immediately began making your patches and they have been a huge success. Not only is my daughter more compliant with patching because she gets to pick which patterns she likes, they are so cheap and easy to make that we always have several kicking around (in the car, in my purse, in her backpack etc etc). I have also been stopped in public on a few occasions by moms fed up with bandage patches and pirate patches asking how to make them. hi, my daughter was just diagnosed with amblyopia today. No surprise, I have it and just like you I always took my horrid black patch off as soon as I could (and my right eye is terrible because of it). So, my almost 3 year old needs a patch and I might just have to make her one like this. Thanks for the tutorial. You’re welcome. I hope it helps your little one as much as it did mine! We no longer need to patch after about 9 months of it. Good luck, Mama! I am so going to make one of these for my four and a half year old. He wants to look like a pirate, so I think I’ll just use black fabric but make a cute (?) skull and crossbones out of felt to go on top. He absolutely HATES wearing a patch because then he can’t see, so I’m hoping to make it more fun for him. Thanks for the directions! So sorry you and your little one have to go through this! I hope a handmade patch helps her. I used felt because it has a bit more structure than flannel. The texture didn’t seem to bother my little guy. And the felt was soft enough to just sort of sit up against the nose piece. I didn’t cut out any special area for it. I hope this helps. If need any more help feel free to use my contact form (where it says contact in the top menu bar) to email me directly. Good luck, Mama! I just read this & I'm going to try making my own patches. I suffer from double vision & extreme sensitivity to light in one eye & now have to wear a patch permanently. I started out wearing the adhesive ones which I really hated. I've now got a couple of leather ones which look nice but they're still pretty uncomfortable to wear all the time. A felt patch should let more air through- the worst thing about wearing a patch for me is never feeling fresh air around my eye & the constant hot, sticky feeling underneath. Plus I'll get a chance to try out a few of my own designs. Wish somebody's made me one 50 years ago! Mine was beige plastic & sometimes just white gauze & tape. Oh yeah, & a pair of glasses with one side covered. White gauze and tape?! That must have been so uncomfortable! Thanks for the warm words. Mine was a hard plastic one of course. Can't believe how unappealing they are for kids. I'm totally sending this on to my adult friend in need of an eye patch! Oh, great! Thanks, Alexa. I hope it helps. Aw! This is adorable, and so is the little guy 🙂 I wish my mom were that clever when I was little and had to do the eye patch. My best friend's daughter does the patch, I'll pass this along to her. Thanks, Natalie! I hope it helps your friends and her little one. And thanks for linking up to Learning Laboratory! This is brilliant! So much more fun than the regular eye patches! Yeah, we weren't so lucky. It's like Sawyer is taking right after me!